On behalf of the NCK community, we would like to congratulate Laura and Muriel with their prizes for best poster and presentation as awarded during the NCK days 2018! Muriel Bruckner (third from left on the picture below) won the prize for her presentation titled: 'Effects of biological traits on salt-marsh species distribution and estuarine bar morphology'. 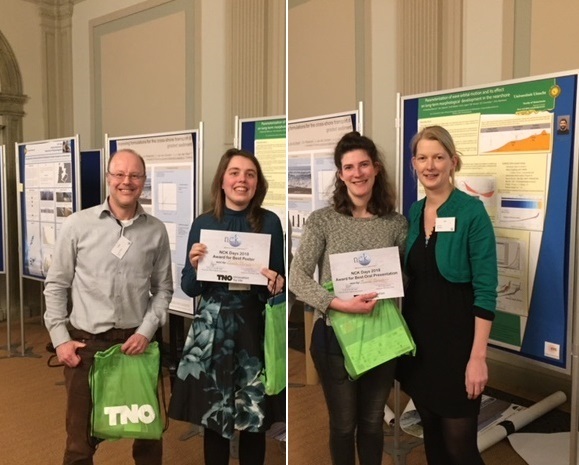 Laura Brakenhof (second from left on the picture below) won the prize for her poster titled: 'Characteristics of saw-tooth bars on the ebb-tidal deltas of the Wadden Sea'.